KATHMANDU, July 20: International non-government organizations (INGOs) are spending over Rs 89 billion since last fiscal year in various constitutional organs and government ministries, including those considered sensitive in terms of national security. 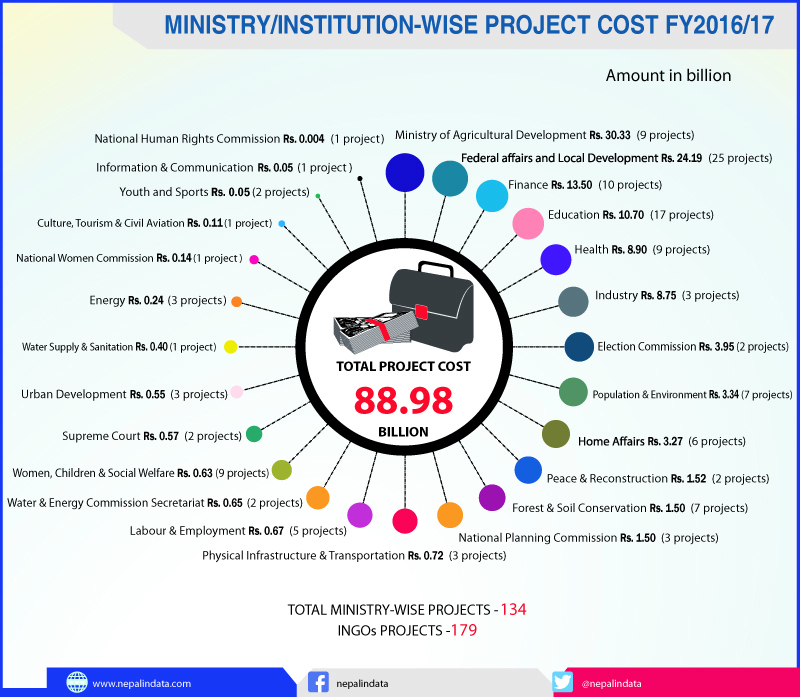 According to the Statement of Technical and Other Assistance published by the Finance Ministry, the INGOs are spending Rs 88.98 billion on 18 various ministries including the Ministry of Home Affairs (MoHA), and on the Supreme Court and the National Human Rights Commission. This indicates that the government’s repeated attempts to control the activities of INGOs within the ministries have gotten nowhere. Former chief secretary in the government Leela Mani Paudyal had taken a decision not to accept any assistance from INGOs at the Office of the Prime Minister and Council of Ministers. “The decision not to take any assistance from donors and INGOs at the prime minister’s office was the first decision I took after assuming office as chief secretary,” said Paudyal over the phone from Beijing, where he is currently serving as Nepal’s ambassador to China. According to Paudel, it took six months to sideline the support of donors and INGOs from the prime minister’s office. He argued that donors and INGOs should be kept away from the country’s policy-making bodies, including the prime minister’s office, parliament, the Supreme Court, ministries dealing with security, the president’s office and the offices of the speaker and the chief justice. Paudyal recalled that his efforts to prohibit the involvement of donors and INGOs in such government bodies eventually failed due to pressure from various quarters including the political leadership. The government bodies are keeping mum even as the donors and INGOs are investing in policy-making bodies rather than investing in infrastructure and other development activities. Although the Prime Minister’s Office is continuing with the tradition started by then chief secretary Paudyal, the donors and INGOs are influencing policy-making through their investment in 18 government ministries. As many as 179 INGOs are running 134 projects amounting to Rs 88.98 billion in the 18 ministries. According to details available in the Finance Ministry report, the projects will run till December, 2018. The National Planning Commission (NPC) alone has received Rs 1.5 billion in INGO money for three ongoing projects. United Nations Development Programme has spent Rs 930 million for ‘uplifting planning and monitoring capabilities’. Likewise, the United Kingdom has invested Rs 308 million, while the Asian Development Bank has invested Rs 708.05 million. Similarly, during the same period, INGOs and donor countries spent a total of Rs 3269 billion on six projects at MoHA. ADB, UNDP, the United Nations Children’s Fund (UNICEF) and countries like China, the UK, Japan, and South Korea among others have been investing at MoHA under various project heads. Rs 51 million, to combat violence against women and children with ‘technical help and capacity building’. Under Secretary at MoHA Kosh Hari Niraula, who oversees the ministry’s foreign assistance desk, said however that there was no participation of donors and INGOs at the ministry’s policy-making level. “They have extended their support in disaster management and building constructions, but not at the policy-making level,” he said. Two projects, budgeted at Rs 572 million, are ongoing at the Supreme Court (SC). Denmark is running a Rs 3.6 billion project to ‘establish rule of law’ and ‘safeguard human rights and increase security capacity building’. The project started in 2013 and is ending in December. Japan is spending Rs 190 million ‘to increase SC’s capacity in conflict management’. The Election Commission, likewise, has two projects of Rs 3.95 billion in total, funded by INGOs and donor countries. The European Union, the UK, Norway, Denmark, Australia, Japan, and the USA are spending on the EC to help in the ‘election process and capacity building’. Aside from this, INGOs and donor countries have spent millions on other ministries and autonomous bodies, including the Peace and Reconciliation Ministry, National Human Rights Commission, Ministry of Federal Affairs and Local Development, Ministry of Labor and Employment, Ministry of Population and Environment, Ministry of Industry, Ministry of Energy, Ministry of Education, and Ministry of Forests and Soil Conservation. Former minister Prakash Chandra Lohani described the situation as terrible and said, “It is a shame that those INGOs are operating freely without government control. They are in a position to run the country.” He further said that controlling the INGOs might be difficult, but the country has no choice but to adopt a stern policy against them. Nepali Congress (NC) lawmaker Gagan Thapa had urged parliament during its first meeting after the second Constituent Assembly election not to allow entry of any donors and INGOs. “I raised this issue after learning that some INGOs had even prepared the CA Regulations. My statement stopped that,” Thapa told Republica. “It is high time we spelled out where donors and INGOs can spend or provide assistance. We may not be able to handle them if this matter is delayed further.” Thapa said the government is already late in discouraging the current practice of seeking foreign aid even for minor works.